Acrylic resins restorations have been widely used in dentistry in the past but since higher quality materials have emerged, they have lost ground. Although they are still used in certain parts of the world as permanent restorations, their main indication is for temporary prosthetic devices. The main advantage is their low cost and easy manufacturing but they are significantly inferior to both porcelain and dental composite. When permanent restorations are designed, they will always have a metal shell on which acrylic is placed in specially prepared areas. Most of the times, acrylic will cover only visible areas of the crown and it cannot be placed on the chewing side of the tooth because of its low resistance. When the cost of a porcelain (or composite) restoration is too high for the patient. To overcome the negative consequences of teeth loss, it is very important to restore the edentulous spaces as soon as possible. This is why an acrylic restoration is better than nothing, at least until the patient will have the financial situation for a superior prosthesis. Limited indications for the following cases : elderly persons, people with other acrylic restorations which they don't want to change, very poor persons. Temporary crowns or other temporary restorations. 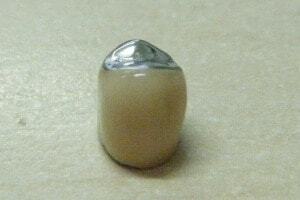 It is the main indication of acrylic restorations. In this case, the temporary crown doesn't need a metal shell because its life span is very short (until the definitive restoration is completed). 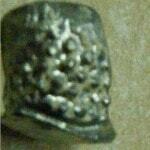 The metal shell can be constructed from various types of metal alloys (chromium/nickel, chromium/cobalt etc.). Normally, base metal alloys are utilized but it is possible to use noble alloys as well. 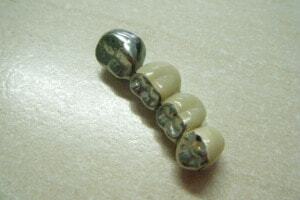 Basically, the metal frame covers the entire tooth ; on the visible part, it has a special "window" which is carved inside the metal shell (see image bellow). The acrylic is placed inside this window and is held in place by small metal "dots" or "scales". Unlike porcelain, acrylic does not bind chemically with the metal, which leads to a less strengthful connection. 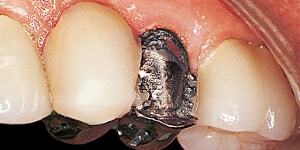 This may cause the breaking or separation of acrylic veneers. Acrylic resins are plastic materials that are processed by means of polymerization in special furnaces at 150-200 degrees Celsius (300-400 Fahrenheit). Most often, the crowns are made with a partial acrylic veneer that covers only the aspects of the crown that are visible while the rest of the crown remains bare metal. 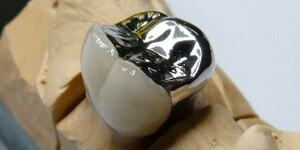 It is not indicated to place acrylic resins on the occlusal side of teeth because of the low resistance. Definitive acrylic restorations have limited indications nowadays. They are normally utilized when patients cannot afford more expensive (and superior) dental restorations : zirconia, porcelain etc. Temporary acrylic restorations are widely used. Temporary crowns are usually manufactured without a metal frame and their main function is to protect the prepared teeth until the definitive restoration is completed.